After a few weeks in London we packed up again and travelled north. I remember the cooing of wood pigeons and the enchantment of high summer in unspoiled country on the borders of Durham and Yorkshire, where my parents had found a house belonging to a friend of the family. 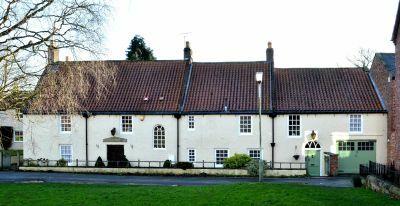 It was in a village by the River Tees, described in the guide books as a ‘late medieval house, with studded front door with affixed carved oak female head, under ogee-shaped lintel (door said to have come from a demolished Saxon chapel). It was set in a high walled garden at the end of the village, and we spent most of our time in the sitting room, a wood panelled room with huge Tudor fireplace and inglenook. If I stood on the head of the tiger on the striped tiger-skin rug, I could just reach the chamfered 17th century beams as a nine- year- old. The casement windows looked onto the garden, and beyond the garden walls, hills and woods stretched to the sky-line. We children were rarely allowed into the drawing room, and then, only if we knocked on the door beforehand. Mostly we stood at the door with whatever it was we wanted to say, but were allowed to sit there when guests came or when we had our lessons. I hankered to spend time in that room, a Georgian addition with French windows into the garden. It was simply furnished with soft flowered chintz, but it had a different atmosphere to the rest of the house – a refined, gentle energy compared with the robust Tudor architecture elsewhere. I loved the slightly faded thirties linen prints on the loose covers on the sofas and chairs, and the black and white tiled hall with its antique chests and barometer. I developed a love of interior decoration and from then on felt uncomfortable in rooms that were ugly or tasteless, and was hungry for beauty when it was absent. My new stepmother, who was lonely, and needed someone to talk to, unconsciously educated me too, looking through the pages of Vogue with me, and discussing the famous and controversial New Look by Dior. She wore clothes that I could appreciate, well-cut grey flannel trousers with a red jacket, elegant suits, nifty little hats with a bit of veil, perched at an angle, incredibly high navy suede court shoes, and severe beautifully cut evening dresses. Everything was new and interesting, the stones in her jewellery, discussing menus, the intriguing friends who dropped in on their return from overseas, learning to distinguish crystal from glass, china from pottery. We didn’t always see eye-to eye. I was deeply upset when the revolving Victorian summer house with stained glass windows, a pointed pitched roof, and a circular table like a wheel which turned the house in the direction of the sun, was demolished, and the circle of soil now exposed, planted with grass. It seemed barbaric to smash this thing of beauty. My stepmother condemned it as Victorian. Anything Victorian was despised by both my parents. This rambling house was a splendid place to curl up in and bury myself in a book. They were in short supply here. The owner had put hers away, and ours were all packed up. My stepmother gave me her textbooks on ancient history, so I learned about Pericles and Alexander, Carthage and Hannibal, there was Tanglewood Tales’, a book on Greek legends by Nathanial Hawthorne, and ‘ Black Beauty’, that animal classic which has influenced me more than any other for the rest of my life, I suspect. Whatever the curse of the motor car, I am glad horses are no longer ill-used, neglected and exploited every day on the streets and in the country-side. “Little Women’, also among my stepmother’s books, had the same potent moral influence on me, as on so many other girls before and after. Interesting that the Quaker background of Anna Sewell, and the Transcendentalism of Louisa M. Alcott should have influenced so many generations of children. I grazed through Palgrave’s ‘Golden Treasury’, which our stepmother used for our lessons. She was not strong on child psychology, but we learned a lot of poetry from the Golden Treasury, including: “Breathes there the man with soul so dead,” from Walter Scott, and Elizabeth Barrett Browning’s ” What was he doing, the great God Pan, down in the reeds by the river?” I can still declaim them both in the overblown elocution class style required of us. Longfellow’s Hiawatha was another favourite of my stepmother, and we learned to recite long passages of this too. We didn’t go to the village school, and never knew anyone from the village except the gardener, Mr Appleby. He took a fancy to me and taught me the names of his flowers in the garden. He certainly behaved as though they were his. His deep red, rich pink, and white peonies were his greatest joy, and had a beauty all their own, as I picked them for my stepmother’s crystal vases. They were as lovely as roses, dripping with dew on their bright green leaves, and droplets nestled in the big flower heads layered with petals like an old-fashioned rose. Since we had our lessons in the afternoon, it was my job in the morning to re-fill and refresh all the flower vases in every room in the house. This was perfect. It got me away from the parents who I was very nervous with – never sure of what was required of me and possible disgrace – and I could spend as much time in the garden as I wanted. Mr Appleby let me pick the best pink and red peonies, there were fat, pink, peppermint-scented pinks, sweet- scented roses, multi-coloured wallflowers and purple penstemons, fragrant white stocks, spiky blue delphiniums and stocky lupins. Snow- in- summer and blue campanula sprawled in crevices on the terrace by the house. He started bringing me treats from his own garden, huge, juicy, golden Williams pears, the fattest, hairiest, rosiest gooseberries I’d ever seen, juicy purple plums with golden flesh. My sister was furious that he never brought her any treats. Then he offered to take me for walks around the surrounding country-side. The first walks were magic. Mr Appleby was probably in his sixties, a wiry little man with red apple cheeks and black stubble, who wore a grubby shirt with no collar and shabby black jackets and worn trousers that would be described as ‘rusty’. He had lived here all his life and knew every path and stream and hill and dale for miles around. He showed me mice nests slung between corn stalks, rubbed the ears off barley for me to taste, showed me the flowers that grew in bean fields and corn fields, where bird’s nests were, and where fish jumped in the pools which gathered between great slabs of flat rock in the river. He explained who owned this field and that great house, he took me by shallow streams he called becks, and up steep cliffs he called scars. The walks extended from five miles at the beginning, to over eight miles one afternoon, up hills and along narrow paths, when I was so tired I thought I’d never take another step. I was always exhausted at the end of these marathons. And then one day he said something I didn’t believe I’d heard. So he said it louder. ” Give us a kiss, then.” How could I be ungrateful after all the things he’d done to give me pleasure. I dabbed a quick peck on his horrid unshaven cheek. He did the same on the next walk. I avoided him in the garden as much as I could. I felt so sick the following week when he came for the Tuesday afternoon expedition that I hid in the top of the pear tree. My stepmother called and called, until my sister revealed my hiding place, and I was sent on my way with admonitions not to be so rude. I dragged behind him for most of the way for the rest of those walks, but there was always a point when at some place he asked for the unwilling kiss. Once, I tried to tell my stepmother about it, but she stared at me disbelievingly, which effectively closed the conversation, and now I look back sadly, and see an achingly lonely and love-starved old man. I loved that country-side. I remember walking by myself to the next village on an errand for my stepmother, dawdling past the long, grey stone wall of an estate, with dark, shiny rhododendron bushes reaching over the top, and hearing the cooing of wood pigeons. There was a clear blue sky, the empty, cobbled village street, no sounds of traffic, nothing but bird song, sunshine, the church clock chiming, shady trees and the perfect happiness of being on my own with nothing to do but walk in this perfect place. The only difference between 1815, when Jane Austen wrote these words at the end of one European war, and 1947 at the end of another European war, was the lack of horses and ginger bread. Food rationing was still as stringent as ever, with Europe on the verge of starvation, while lack of petrol meant no cars spoiled the peace of this north country village. And all this was about to change as we sailed from Harwich to the Hook of Holland on our journey to join my father at Belsen, the notorious concentration camp in the heart of hungry, war-ravaged Germany. My tomato plants are flourishing, so I have a glorious glut of tomatoes. This was my solution the other day. Fry the chopped tomatoes gently in olive oil… the skins come off easily as they cook. When soft, pour in lots of cream, and as it boils to thicken, stir in a small lump of Dijon mustard, salt and pepper, and let them all meld together. Two- minute noodles were a quick answer to some padding for the tomatoes which were poured over them. With fresh parmesan grated over the tomatoes it was a fragrant, delicious light lunch. A small glass of red or white wine is a great enhancement! I love traveling with you, Valerie; your writing is so beautiful and descriptive that I could picture the places you visit. I’ll be on board for the next segment. Oh Great, so good to know you’re there, and enjoying the story.. thank you for the lovely things you say… discriminating readers are so precious !!! It would be lovely to live in that wonderful old house. The destruction of the Victorian (anything Victorian) made me say OUT LOUD NO!!!! As for the gardener…I do believe his asked for kiss was out of line…lonely or not. I wanted to put my protective grandmotherly arm around you and draw you back into the garden safely away. It sounds like something out of Jane Austen! well, the times sometimes felt like that !!!! Thank you for staying around for the story !!!! I love it that you can look back on the old man with understanding and kindness. Daughter of the Moon, Nokomis… is all I recall from memorising much of the poem as a youngster, one of the few literary moments in my childhood, unlike yours! A lovely read, Valerie. Oh Ardys, what a lovely comment… I read the Hiawatha lines out loud, savouring that thumping rhythm !!! Angela, so good to hear from you… thank you for your lovely comment I really appreciate it.. and always love to see your name pop up..
Oh my, what a feast for anyone who grew up on the English classics but lived in America hah! Beautiful, Valerie. I love the Vocabulary you used to describe the house, and I can still see the peonies! A wonderful house, a beautiful garden and Hiawatha along with your other reading, just lovely. The cringe of the kindly old man wanting a kiss – how many of us had something similar? For me it was my Primary school Headteacher (and I never told anyone either) who knew my love of all things stationery and offered me paper and pencils if I went to meet him on Saturday morning. I only went once……. How interesting to know that you too had one of these unwanted encounters… the Me-too campaign seems to demonise so many men that it makes me sad for all the good men in our lives, but certainly back then, there seem to have been a few too many ‘blips’ !!! Hope you get the chance to enjoy a glut of tomatoes when your summer comes ! Such lyrical writing, Valerie – it reminds me a bit of the beautiful descriptions of an idyllic country life in Laurie Lee’s Cider With Rosie. And thank you for bravely sharing your experiences with the old man. You are generous in your reflections about this episode. Dear Liz, you couldn’t have said anything more beautiful to me ! As I see where you left off and when where you went next I’m left with a sense of dread. I love joining you on your journey. I could almost taste the plums but felt the horror of the old man demanding a kiss. You brought back my own memories of “Little Women” and how many times I read and reread it from the simplest version picked up in a supermarket when I was 8 or 9 to the unabridged version borrowed from the library in my teens. Have you read “March” by Geraldine Brooks? It’s the father’s side of the story that the author based on Louisa M. Alcott’s father. I opened it with fear and trembling but was delighted with it. A beautiful companion to Little Women. There I go off on my tangents that your stories inspire. Thank you for your generosity in sharing your memories, both good and not so good. Hello Rochelle, thank you as ever for your fll and chatty comment !!! Valerie, your memories are so vivid, your writing so lush, descriptive and informative. You describe such a fascinating life, it’s a joy to read each installment. Looking forward to the next installment. Your description of the idyll beside the River Tees is as captivating as Austen’s. Thank you so much… what a lovely comment and lovely thought !!! Your writing pulls me in Valerie! I love reading your memoirs, you have such a good memory and there are such vivid details remembered to bring visual life to the narrative as I read. The house sounds so evocative and such a rich experience to live there. I can totally understand why it triggered off a love of interior design. I wish I had more time to read your posts, and wish I could read your story in a book, which i hope you are considering doing at some stage. My mouth drops open (honestly) when I’m reading your posts, in admiration of your memory, knowledge and skill in writing. Oh this is such a dramatic story Valerie, and so vivid. I am hanging on every word, and wanting that young you to be loved and happy, just so much!